Just when I thought I had plenty of time to get everything done I find time slipping away too quickly and the May news is very late indeed. So sorry for that, but I hope you enjoy the story of one of our special successes nonetheless. More often than not when I think about writing our newsletter I concentrate on the children and their achievements first of all. For our May news we have the story of some special adults for you. I know I have mentioned Andre before, but his story is, I hope, typical of the stories of many others in the future who are being helped by our work in Rwanda. Andre, now our very good friend, came to Kigali in 2007 from his home in a remote village in the south-west of the country. He is the youngest son of a large family. His older brothers made sacrifices to find the money to send him to school, a privilege they had not enjoyed, and after he finished his secondary education he left for Kigali to try to find work. He found work as a security guard working for friends of mine, which is how we met. At that time he spoke no English but he was fluent in French. When our friends left Rwanda for Europe in 2009 I took Andre with me to Kinamba to work as our guard. The children loved him and he was a much respected member of our staff. 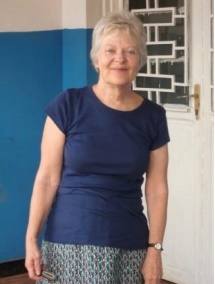 During 2009 and 2010 Karen came to work with us as a long-term volunteer. 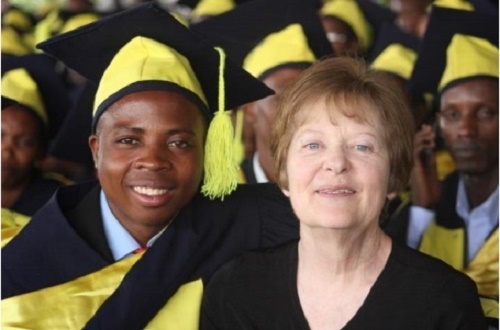 I know she would say that her time in Rwanda changed her life – it certainly did for Andre, because Karen decided that she would support him through university. He enrolled at ULK university in Kigali on a degree course studying Accountancy. He continued to work with us at the same time studying in the evenings. He was very successful in his first two years, coming first in the year group. By February 2010 Andre found that he needed more time to study and we said a sad farewell to him as a guard, but not as a friend. He kept in contact with us, visiting regularly, attending our special events and helping us out when we needed him, especially with translation because by then he spoke very good English. When he was again first in his group once I congratulated him – he replied ‘that is my objective! His application and dedication to his studies has been admirable. I often talk about the Rwandan attitude to education when I am talking about our project. Education means everything and people go to extraordinary lengths to learn. Years passed and in December 2013 we went with Andre to support him at his viva when he presented his dissertation. We were all very proud and also nervous on his behalf but he passed with distinction, a very proud moment for him, for us, but also especially for Karen so far away in the USA. This was a very big day for us all and we celebrated in Rwandan style with photographs and a huge feast followed by speeches. Most of the staff were there, as were a few members of Andre’s family and some of his friends. And then to eat – traditional Rwandan buffet style with plates piled high with delicious food followed by speeches. But the best was to come in February 2014 when some thousands of students received their diplomas. We were thrilled to welcome Karen back for the big event. We went early in the morning to be sure to get a good place where we could see everything. The different faculties came into the stadium and it was difficult to spot Andre but we eventually saw him resplendent in his cap and gown. Naturally the ceremony was very long, with each student’s name being read out and many speeches from the various dignitaries. Eventually the Head of Andre’s faculty spoke and caps were thrown into the air. Such a very proud moment for Andre and for Karen, without whom none of this would have been possible. At the beginning of his final year Andre was head-hunted by the BCR bank in Kigali. He started work there almost a year before graduating, working during the day and studying at night. He now works at the Bank of Kigali, earning a good salary and able to help his family as is the tradition. He has been very fortunate and he knows it, he has also contributed to his own good fortune and has succeeded far in excess of what he could have imagined when he first took the bus to Kigali. Thank very much to you, Karen, for your generous help in sponsoring Andre. Andre has been our trail-blazer, I am looking forward to many more ceremonies – together we can make such a difference.